Enjoy the beautiful Primitive Art of Billy Jacobs like “A Light In The Window” in the size that best fits your home. Our Frames are made of poplar wood painted black and assembled. Delivery time: This print will be delivered to you in 10 – 14 business days. Our Frames are made of poplar wood painted black and assembled. Styles come in your preference of Round 1 3/4 inch or Deluxe (Flat) 2 1/8 inch. See our Billy Jacobs Gallery! Thank you for choosing to shop with us and considering this beautiful print, A Light In The Window Print by Billy Jacobs! Enjoy the Primitive Art of Billy Jacobs like "I Heard The Bells" in the size that best fits your home. Frames are made of poplar wood painted black and assembled. NOTE: Frame displayed above is not always proportionally correct on website. 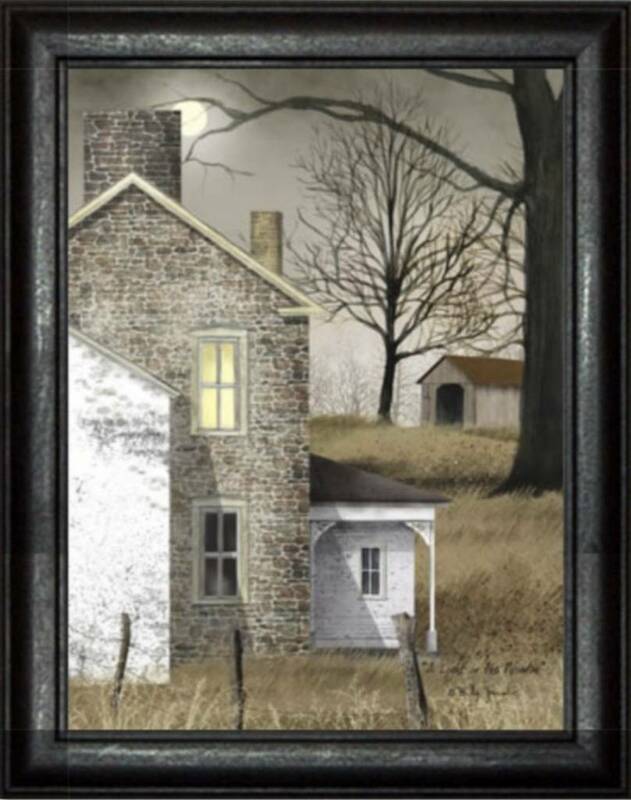 Enjoy the Primitive Art of Billy Jacobs like “A Cold Winter’s Night” in the size that best fits your home. Frames are made of poplar wood painted black & assembled. Styles come in your preference of Round 1 3/4 inch or Deluxe (Flat) 2 1/8 inch. Enjoy the Primitive Art of Billy Jacobs like “Antique Barn” in the size that best fits your home. Our Frames are made of poplar wood painted black and assembled. Styles come in your preference of Round 1 3/4 inch or Deluxe (Flat) 2 1/8 inch.. Enjoy the Primitive Art of Billy Jacobs like “Fall Gathering” in the size that best fits your home. Frames are made of poplar wood painted black and assembled. Pick your style frame. Delivered in 10 to 14 business days. Enjoy the Primitive Art of Billy Jacobs like “Winter Coat” in the size that best fits your home. Our Frames are made of poplar wood painted black and assembled. Styles come in your preference of Round 1 3/4 inch or Deluxe (Flat) 2 1/8 inch.. Enjoy the Primitive Art of Billy Jacobs like “Early American Home” in the size that best fits your home. Frames are made of poplar wood painted black & assembled. Styles come in your preference of Round 1 3/4 inch or Deluxe (Flat) 2 1/8 inch.